Dr. Rudra Kaul from Department of Conservative Dentistry and Endodontics, Indira Gandhi Government Dental College, Jammu, recently conducted a study. The study focuses on the efficacy of four different desensitizing agents in relieving post bleaching sensitivity. Bleaching is one of the most widely adopted treatments for teeth whitening. However, it has a major side-effect – dentinal hypersensitivity. In fact, close to 14% of the patients have been estimated to drop out of their bleaching sessions due to severe tooth sensitivity. The study was written and published by Dr. Vibhuti Kaul and is under the HOD-ship of Dr. Azhar Malik. It proves that RA Themoseal is the fastest-acting tooth sensitivity toothpaste. 100 patients undergoing bleaching treatment took part in the study. They were randomly allotted to 5 groups with 20 patients in each. Four groups were allotted different desensitizing agents and one group (control group) was given a placebo. The patients were given the agents in unlabelled tubes for regular use at home for the duration of the study. To compare the clinical efficacy of different agents, objective and subjective scales were used. 0 – Absence of pain but perceiving stimulus (no sensitivity). 1 – Slight pain (mild sensitivity). 2 – Pain during application of stimulus (moderate sensitivity). 3 – Pain during application of stimulus and immediately after (severe sensitivity). Here, patients were asked to record any unstimulated tooth sensitivity on a daily basis. Using a Visual Analogue Scale (VAS) provided to the patients, they gave a score on a scale of 0 to 10 for each week after a bleaching session. On the scale, 0 referred to the absence of tooth pain and 10 referred to severe tooth pain. For statistical analysis, chi-square test, ANOVA and post hoc Tukey’s test using SPSSS was used, and P value was set at 0.05. It was found that the desensitizing agents used in the study are effective in reducing tooth sensitivity after an in-office vital tooth bleaching. Although due to the differing constitution of the four agents, some statistically insignificant variation is noticed on both scales. However, RA Thermoseal showed the quickest onset of action from the first day itself. 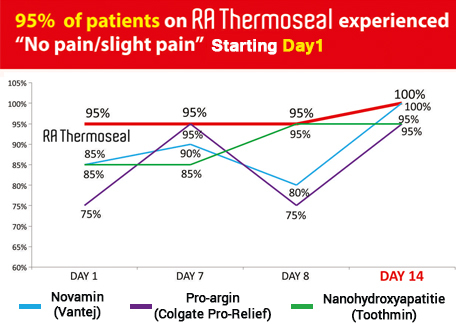 This proves the effectiveness of RA Thermoseal as a fast-acting toothpaste for tooth sensitivity.